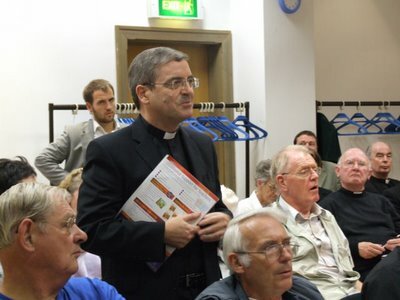 Today I was up in Westminster at Vaughan House for the launch of Evangelium, a new catechetical resource which I have mentioned a few times on this blog. 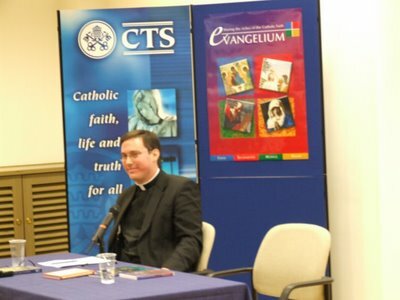 Fergal Martin from the CTS introduced the presentation, telling of how they are often trying to dream up good material and that he was delighted when two seminarians walked in with an excellent programme they had developed while teaching young people in Rome. 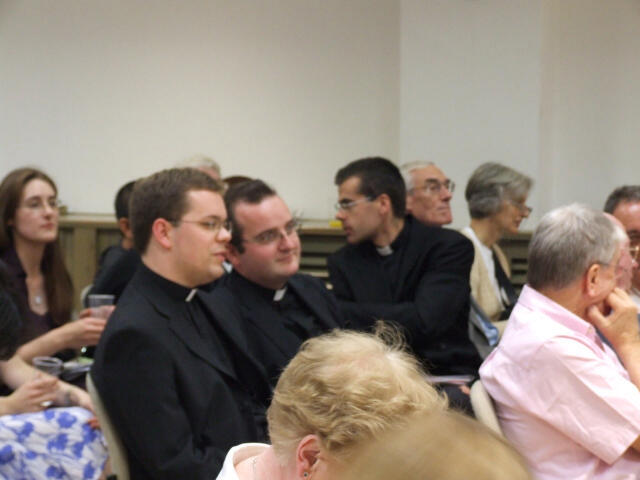 ... and Fr Andrew Pinsent who is currently engaged in a research fellowship in Philosophy over in the states, but is home for the summer. Evangelium consists of 25 stand-alone modules following the structure of the Catechism of the Catholic Church: Creed, Sacraments, Morals and Prayer. Each of the 25 modules is covered by two pages in an attractive, colour participants' book. 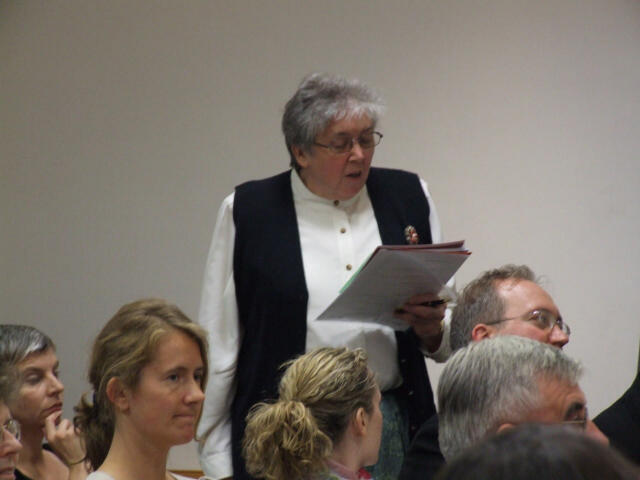 The Presenter's book gives suggestions and guidance on how to present each session, leaving room for individual initiative but giving plenty of help for those inexperienced at teaching. The CD has a PowerPoint presentation for each module. Overall, the course is of very high quality indeed, providing doctrinally accurate but user-friendly definitions of what we believe, and giving participants a real sense of progression as they learn about the faith comprehensively. 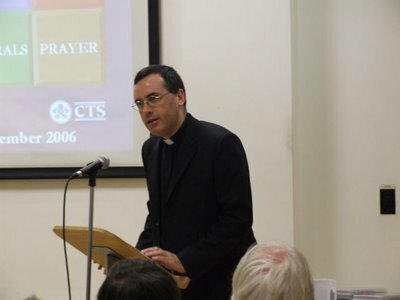 The course also acts as an introduction to Christian life and prayer, drawing from the scriptures and the classical prayers that the Church has used through the centuries. 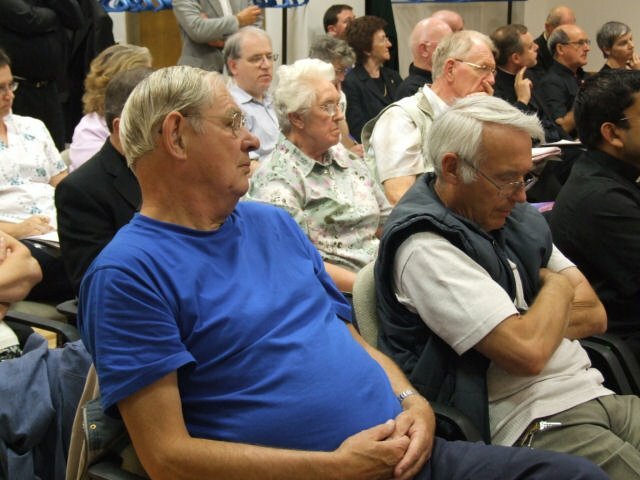 The launch was very well attended with standing room only. There were quite a few familiar faces. Fr Richard Whinder (left) seems to appear in many blogs. 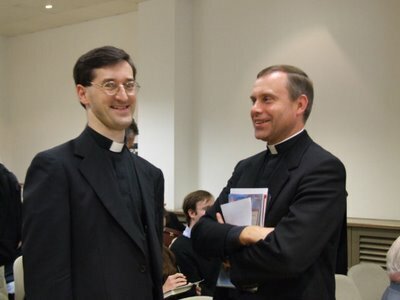 He is here pictured sharing a joke with Fr Mark Vickers. 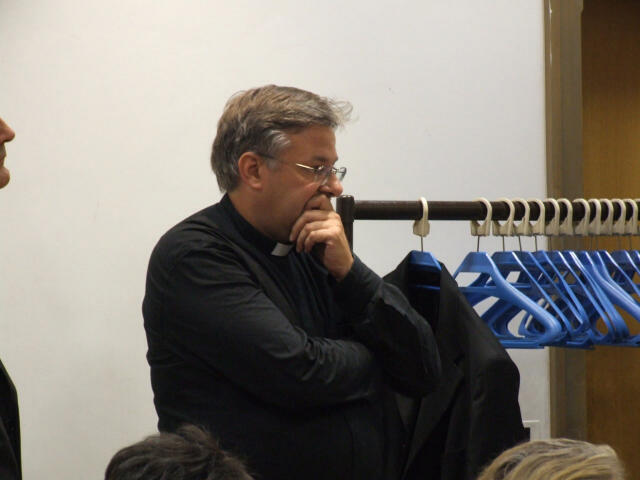 Most of the clergy (especially the younger ones) and I think most of the people at the launch were very positive about Evangelium. 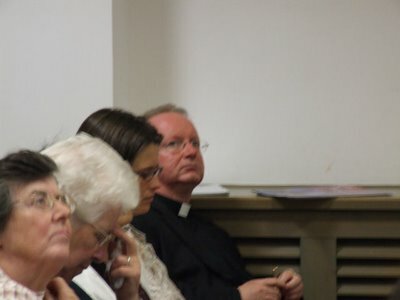 Questions were raised by various members of the audience about the programme not using art from other cultures, whether there was enough provision for the visually impaired, how it would fit in with lectionary-based catechesis, whether Evangelium really gave the teaching of the Gospel, and whether the presentation would work on an Apple computer. Frs Holden and Pinsent, as well as the CTS emphasised that the materials could be developed to include helpful suggestions from users. However, I did wonder whether some of the questions were what counsellors call "the presenting problem". In other words, I felt that maybe there was really something else that they didn't like about it. Certainly, I think that the point about the gospel was misguided. 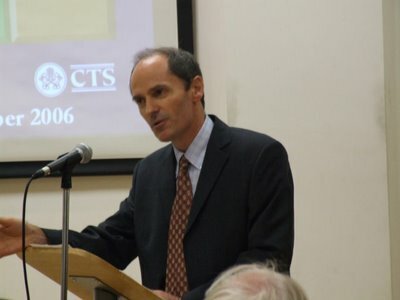 The gospels set out the teaching of our blessed Lord on what we should believe, how we should live, and how we should pray; and it is the teaching of the Church that Our Lord instituted the seven sacraments. He also founded the Church and instructed the disciples to teach. 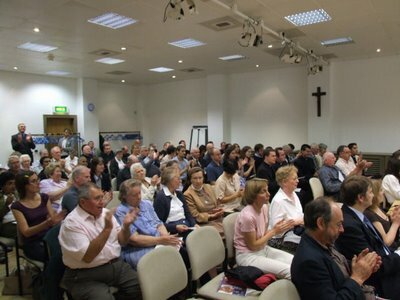 Therefore, to arrange a course of catechesis based on the structure of the Catechism of the Catholic Church is to offer the teaching of the gospel within the context in which the Gospels were written, namely within a living community founded by Christ to make that teaching known to the ends of the earth.